Her Majesty, accompanied by members of the Royal Family, was present at The Queen's Birthday Parade on Horse Guards Parade at which The Queen's Colour of the 1st Battalion, Welsh Guards was trooped. For more: BBC article and video, Telegraph article. 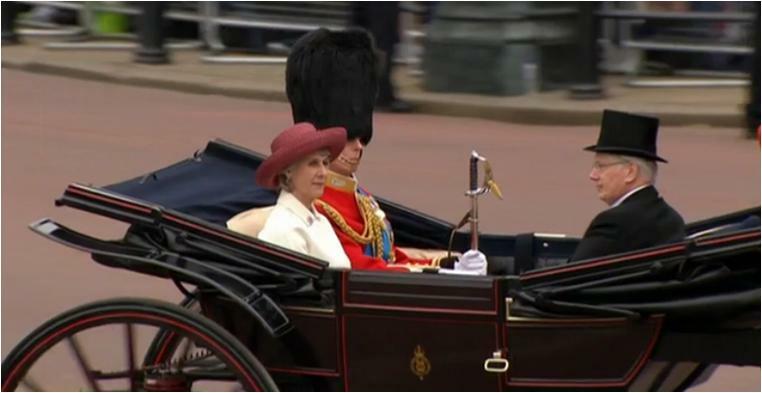 I do prefer Her Maj in brighter colors at her birthday parade, but I'm liking the shorter hat and the bow to the side. It's cute, and one should always look cute when celebrating one's birthday. And of course the Guards Badge is in place, dependable as ever, combining the Household Regiments into one sparkly symbol. 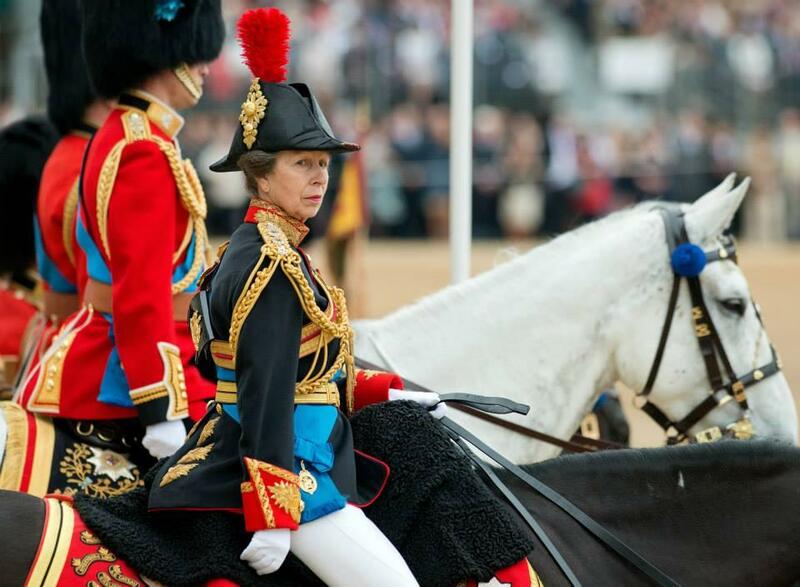 The Royal Colonels were all dashing in their respective uniforms: The Prince of Wales (Colonel of the Welsh Guards, and marking his 40th year in the post), The Duke of Cambridge (Irish Guards), and The Princess Royal (Blues and Royals) riding behind The Queen's carriage; The Duke of Edinburgh (Grenadier Guards) in the carriage with her; and The Duke of Kent (Scots Guards) in the third carriage. The KCVO is the neck badge and the star; the three medals (his Afghanistan campaign medal in addition to Golden and Diamond Jubilee Medals) are the same as usual. Harry's companions in the first carriage: The Duchess of Cornwall and The Duchess of Cambridge. 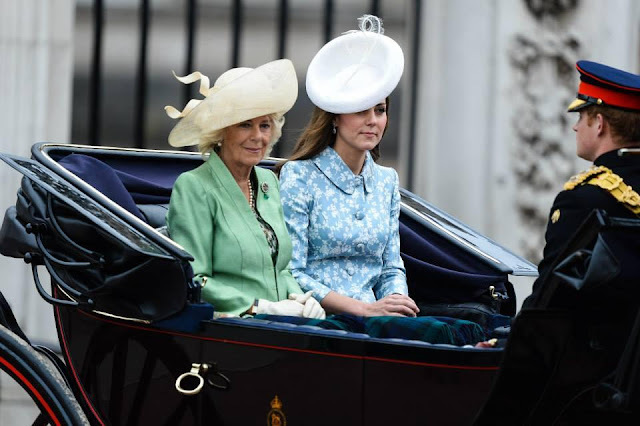 Camilla selected one of her classic outfits, an ensemble she accessorized as usual with her diamond Prince of Wales' feather brooch with a cabochon emerald drop, a piece that was a wedding gift to Princess Alexandra for her wedding to the future Edward VII. The Duchess also added a single strand of pearls, a favorite necklace, and her Everyday Pearl Pendant Earrings. 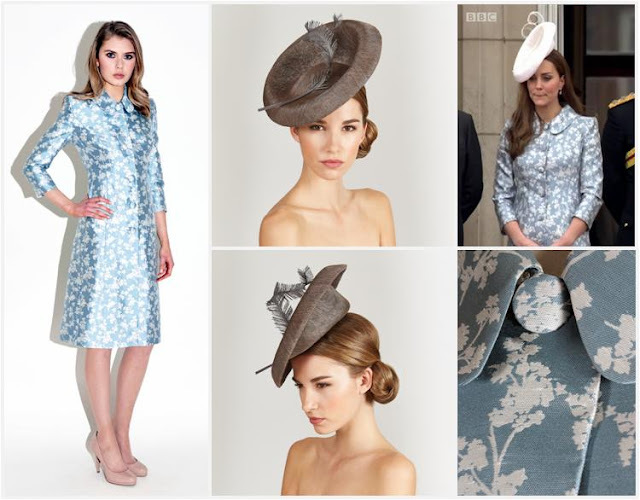 The Duchess of Cambridge made her first appearance since Princess Charlotte's birth in a coat by Catherine Walker and a hat from Lock & Co. 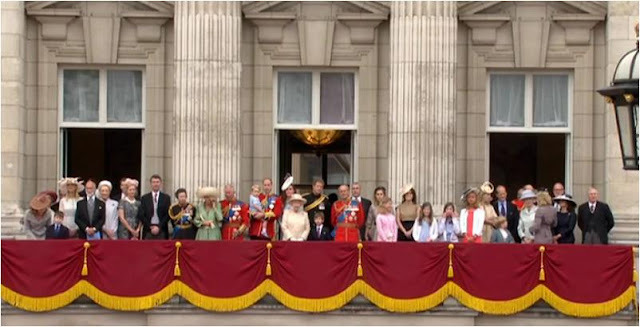 I'm happy to see some pattern up on the balcony, but I definitely mistook that hat for a dented mixing bowl, especially in white. In the second carriage, The Duke of York rode with Princesses Beatrice and Eugenie. A very drably dressed group, aren't they? How about a little color, Yorks? The Earl and Countess of Wessex often take the third carriage, but since they are in Sweden to attend Prince Carl Philip's wedding, The Duke of Kent, The Duke of Gloucester, and The Duchess of Gloucester took it instead. The Duchess looks smashing in pink, don't you think? Note her diamond and ruby clips on her lapels, completing the red/pink color scheme. 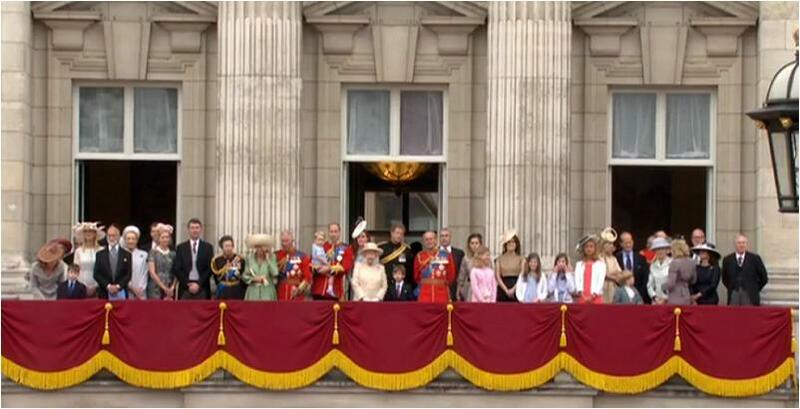 And on the balcony: the whole fam damily. (Including the Wessex kids, Lady Louise and Viscount Severn, which was lovely to see). Notable in the crowd: Look Ma, no eye patch! I was honestly looking forward to seeing how Princess Michael would have accessorized it for Ascot, though. Are they trying to kill us with the cute?! (Yes, yes they are.) Come on now!